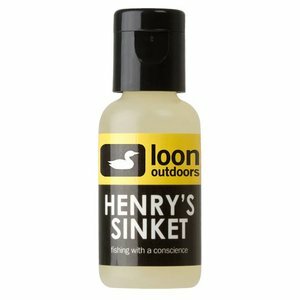 Loon Henry's Sinket, Flies treated with Henry’s Sinket quickly break surface tension and rapidly drop in the water column to where the fish are. Loon Henry's Sinket, Flies treated with Henry’s Sinket quickly break surface tension and rapidly drop in the water column to where the fish are. It helps nymphs get deep, where they roll along the bottom as naturally dislodged nymphs would. It’s especially effective on streamers, getting flies down on the first cast rather than waiting until the materials become saturated. Henry’s Sinket is completely biodegradable.Loon Henry's Sinket.